"A ship's log, as told by the ship"
This is the log of the starship Starwalker, as recorded by the ship. It is 2213. The Starwalker is a starship with an experimental star-stepping drive. Designed to use the gravity wells of stars to fold space, she can travel between star systems faster than FTL. That is, if they can get it to work. Starwalker is the AI of a new ship, and the story starts with her waking up. However, even before she’s done booting up, she’s already got a fully loaded snark program running. 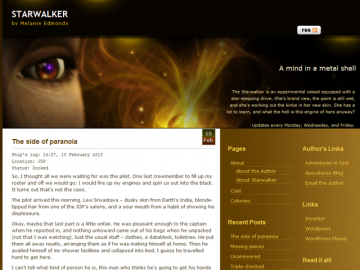 Starwalker is the new web fiction project by Melanie Edmonds author of “The Apocalypse Blog”, and in my opinion it’s a much stronger project. Starwalker (the ship) has a wonderfully distinctive voice. I can imagine what she sounds like just from the way she uses words. Starwalker has not been recommended yet.